The first dish that I would like to talk about is by far one of my most favorites: Khoresht Ghaimeh. 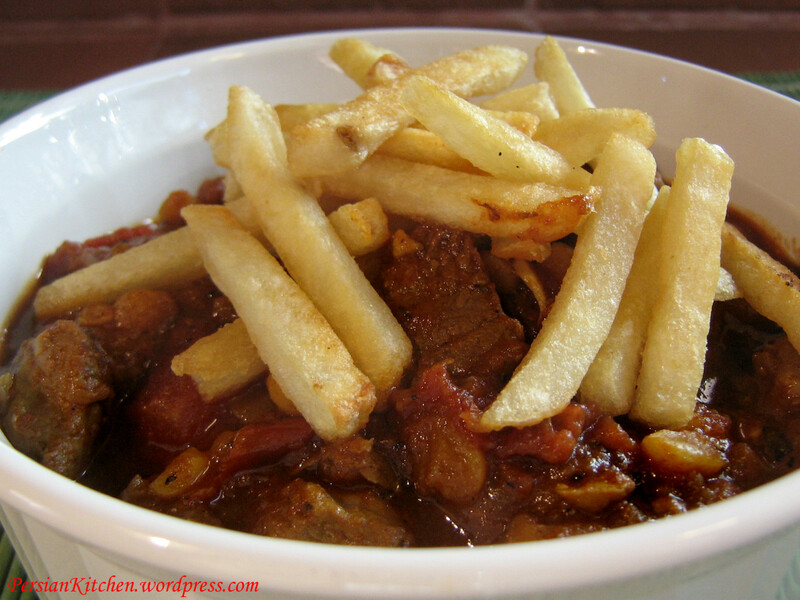 This is a delicious blend of meat, split peas, tomatoes, and spices topped with French Fries. Not only this dish is really good, it is also a very easy one to make. What I also love about this dish is the simplicity of the ingredients and how well they go together. I have made this recipe a few times a it has been a hit with our guests. Once the meat has been browned add the turmeric. Look at the color, so vibrant! Give it all a few stirs allowing for the turmeric to release its flavor once it hits the oil and heat. Now also add the Persian Lemons, add 5 cups of water, throw in some salt and pepper for seasoning, cover and cook for 1 hour. During this step you are essentially making your own meat broth for this stew. Add tomato cans, split peas, tomato paste, and advieh. Cook for 1 1/2 to 2 hours. While your stew cooks give it a stir every so often to make sure that the bottom does not stick. Also adjust for seasoning as you cook. One thing is sure though, by now your kitchen smells heavenly! About 15 minutes before you are planning to serve your food cook the French Fries. Now, you can totally be ambitious and make your own French Fries from scratch. More power to you if you do. Your other option is to buy a bag of frozen French Fries and go to town with it. I like to bake mine which always come out very good. Take a cookie sheet and spray it with some olive oil and place French Fries on top –you might want to add a few extra than necessary because you will be tempted to take a few and eat them! Bake at 400 ° for about 7 minutes on each side. Take out of the oven and sprinkle with salt. Once the Khoresht is done place it in a serving bowl and top with French Fries. Serve over rice. the aim of it was to cook Khoresht Ghaimeh. well what can i say…. ? really it was delicious and exciting! I am soooo happy to hear that you not only made this recipe but you also liked it! This is so exciting for me and I will definitely post more meat dishes! This is my favorite Khoresht! I like your recipe – it doesn’t add additional cinnamon (I think the advieh has enough). Sometimes when I don’t feel like the mess of making fries, I’ll use those potato stick things. In Iran, the slang name for this Khoresht is Imam Husseini. Every year, when grieving/marking Imam Hussein’s death, it is customary to prepare this dish and give it to the poor and hungry. This particular Imam was known for his kindness of the poor and downtrodden. Hence, Imam Husseini. Keep up with the site – it’s great! thanks for your kind words. I had no idea that this khoresht had a religious association. This is really interesting information for me to learn. I agree about the cinnamon, I think advieh on its own has a nice balance of spices and adding more overpowers the taste of the actual ingredients. I personally think that it is so much better with fries than potato sticks as I find them to be too greasy. Nevertheless, it is a good shortcut! Please keep on coming back and let me know about any other background info you may have about other Persian dishes. Love this blog! I just moved in with my Persian boyfriend, and I’m eager to try cooking some of this delicious food! He’s living farther than an hour from home for the first time in his life, and I would love to make some of these familiar flavors for him. Just curious on this recipe…if I don’t have have access to Persian lemons, is there a more available replacement? Thanks!! Suzanne, thank you for your kind words. It is so nice of you to want to make Persian food for your b/f, I am sure he will appreciate it! As a substitute you can use fresh lime juice. I hope this helps! How would I be able to make this vegetarian? Help! Jackie, you can omit the meat and cook everything else together. Alternatively, you can also add some fried eggplant to it. It’s delicious that way. Hi! I know advieh is spices but which exactly!!! Thanks you so much for your website and recipes. I can now finally make Ghaimeh for my family out here in Colorado. My wife is Persian and we are originally from So Cal.Beside’s her family making food there was alot of markets and restuarants in Irvine where we lived. We moved a couple years ago and there is so little if any Persian restuarants/markets. This came out just as good as it looked. I used to post alot when I first started cooking your recipes but then I stopped because I figured my words would be redundant. But, I decided to give you an update. This dish is by far my most favourite dish (with Asheh Reshteh and celery stew coming right after). I have been impressing my persian husband with your recipes for so long now that I hardly remember how to cook anything other than Persian food (I used to make alot of meat/potatoes/gravy kind of food, and NEVER rice unless it was Uncle Ben’s HAHAHA). My daughter is obviously Persian through and through. She just turned two and her favourite food is Khoresht Ghaimeh followed by gourmeh sabzi! I can’t thank you enough for transforming my family for boring mostly processed food eaters into homemade from scratch herb eating maniacs! I also should add that with this dish I ALWAYS add okra (got the idea from your okra stew recipe) because it just makes it over the top delicious. Oooo, I forgot to mention, instead of canned tomatoes I add 6 peeled roma tomatoes because I find the flavour and texture is more delicate and less “tomato-ee”. If that makes sense! This past Saturday, I made this dish for the 1st time. Along with this recipe, I used a couple of others to create my own variation of it. One of the recipes called for 3-4 limu omani and I added four. My mother thought it was quite strong in the lime flavor. How many should I add next time, 1-2 maybe? When should the limes be added, at the beginning or half way through cooking? BTW how many people do your khoresh recipes generally serve? Christopher, I would add 2-3 limes. This recipe is good for 4 to 6 people. Might be a stupid question, but after you pour in the 5 cups of water and you’re cooking your meat broth for an hour, are you supposed to cook it on medium flame or low flame? Hesam, cook it on medium. Will be making tonight…!! Will let you know how it turns out.